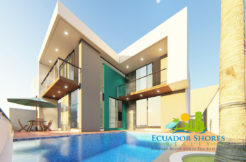 The Oceania is the top echelon of beachfront living in Manta Ecuador. Nothing has been overlooked in creating the most luxurious condominium development in Manta’s history. You want the best of the best? This is it! The Oceania is what you have been dreaming about plain and simple. The attention to detail and the commitment to service is unparalleled and unrivaled. These condominium units are for those people who want nothing but the best, and only the best will do! The inside of this 4 bedroom, 4.5 bathroom luxury condo boasts imported Peruvian tile and rich granite throughout. The grand space is amplified with the kitchen open directly to the living and dining areas. Large double sliding glass doors can be used to allow almost your entire wall to be open to the Pacific Ocean and sea breezes! 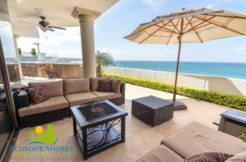 From your posh oceanfront perch you will be able to sit and relax while gazing out over the great Pacific, watch the cruise ships come in at the port, or even watch the whales jumping just offshore during whale season! The location is nothing short of the best as well. 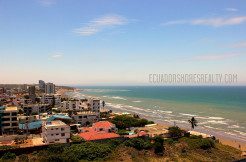 You will be within walking distance of the beachfront shops and restaurants, Fubeca Pharmacy, and the brand new luxury Mall Del Pacifico! This unit is brand new and never been lived in. It is being sold unfurnished so it is a blank canvas for you to design your masterpiece. The price for this luxury home is under market at only $429,900 including 2 private parking spaces and additional storage unit. All this means you can have beachfront luxury for less than $175 per square foot, try doing that with luxury beachfront back in the States! This is one of only two units remaining at the Oceania so act quickly to secure it! Private elevated grass area with Palms and lounge chairs. Custom beach home featured on House Hunters International! 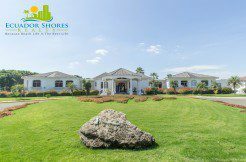 Montecristi Golf Club Lot – Manta Ecuador Golf!